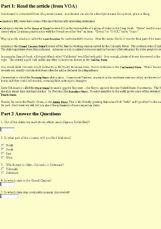 Short online reading exercise with 12 questions. 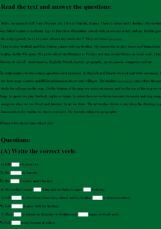 Students look at the picture, read the sentence and choose the best answer. After just a few lessons we can begin to work on reading comprehension and that way we eliminate fear that some children have of language learning. An extensive quiz on the entire book "Me Before You" by Jojo Moyes. The article comes from VOA, but the questions were written by me. 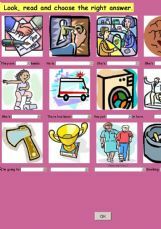 Reading time for comprehension and to exercise making questions. 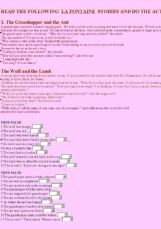 A reading comprehension with 5 multiple choice questions. Ss. 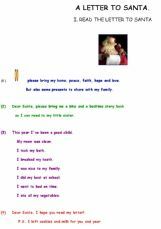 have to read a letter to Santa, after that they answer to check reading comprehension. 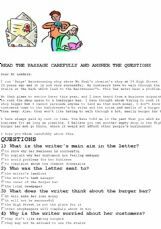 Two simple texts with questions to practice reading.